Joel Bourgeois (Grand-Digue, NB) has represented Canada at an astounding 14 World Cross Country Championships. His best finishes were 32nd (as a junior) and 35th (1999). Joel is also the 1999 Pan-Am Games champion in the Steeplechase, an event where he holds a personal best of 8:20.08. He has represented Canada at the Olympic Games (2000), the Commonwealth Games (2002) and the World Championships (1999, 2001). He is the 2009 Canadian Mountain Running Champion. Adrian Lambert (Edmonton, AB) has been to two Mountain Running World Trophy races. He was 21st in 2007 and 75th in 2008. He was the Canadian Mountain Running Champion in both of those years. He has also represented Canada in cross country at the 2007 NACAC and 2006 FISU championships. He was a CIS All-Canadian in cross country in 2005 (2nd team, 14th) and 2006 (First team, 7th). Jason Loutitt (Duncan, BC) is a three-time Team Canada member. Jason is a firm believer in the potential and spirit of mountain and high altitude running. He is currently a member of the Salomon Flight Crew and a Vega Run Ambassador. Jason’s best finish at a World Trophy event was 32nd in 2005. He’s also finished 3rd at the World Skyrace series in Mexico, and is the 2008 Canadian Snowshoe Champion. Ed McCarthy (Vancouver, BC) has recently refocused on mountain running, having spent half of his life nordic skiing. This year Ed won the 5Peaks Golden Ears race, as well as the Iron Knee. He was 10th at the Canadian Mountain Running Championships. In his years as a ski racer, mostly with the XC Ottawa racing team, he was a member of the Canadian Junior National Team and saw international racing experience as a junior in Europe and at the 2009 FISU Winter Universiade in China. Ed is currently completing his Master's degree in mechanical engineering at the University of British Columbia. Scott Simpson (Sackville, NB) joins the mountain running team for the first time. He is the 2006 Canadian 10000m champion, and a two-time member of Canada’s entry at the IAAF World Cross Country Championships. This summer he was also Team Canada’s physiotherapist at the FISU World University Games. Kris Swanson (Tumbler Ridge, BC) was 73rd at the 2008 World Mountain Running Trophy. In 2009 he finished 3rd at the Canadian mountain running championships. He was also a CIS All-Canadian in cross country in 2005 (2nd team, 11th). He currently works as a personal trainer in Victoria, BC, and attends the University of Victoria. Gord Minaker (Kelowna, BC) is a grade 11 student and has been competing at provincial level for three years in cross country running. He recently competed in his first mountain race at the Canadian championships, and placed first among juniors. Syl Corbett (Calgary, BC) will be making her fourth appearance on the Canadian mountain running team. Her best finish was 41st in 2003, as part of Canada’s best women’s team finish (10th). Syl is currently doing graduate work in human movement and neural physiology. She is a former member of Canada’s duathlon and triathlon teams, winner of several marathons, including Calgary in 2003 and 2004, and the 2009 Canadian Snowshoe Championships. 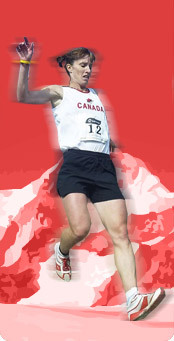 Amy Golumbia (Calgary, AB) is the 2009 Canadian Mountain Running Champion. She also represented Canada at the 2006 World Mountain Running Trophy in Bursa, Turkey. In 2005 she had twins and is not only a mother of two young girls, but a holistic nutritionist and an advocate for Christmas Future, a Canadian charitable organization. She is sponsored by Arcteryx and is also an ambassador for Vega. Jessalyn O’Donnell (Duncan, BC) is a first-time member of the Canadian mountain running team. She finished second at the Mt. Tzouhalem Gutbuster race in 2009, and was the winner of the Westwood Lake Gutbuster race in 2008. Emily Solsberg (Duncan, BC) began mountain running while living in New Zealand from 2003-2005 and is coached by Kevin Ross from Wellington, New Zealand. Her racing highlight is competing for Canada at the 2008 World Mountain Running Trophy in Sierre, Switzerland although her favourite races are still the Gutbuster Trail Running series on Vancouver Island, BC. She is ecstatic to be re-united with her coach Kevin this year at the championship in Italy. She lives in Vancouver with husband James Richardson (also a former Team Canada mountain runner) and works as a musculoskeletal physiotherapist in private practise. Team managers will be Anthony Lambert and Jennifer Harris. The team will travel to Campodolcino, Italy, from Sept 3-7 for the 25th World Mountain Running Championships. Pam Doyle/Banff Crag and Canyon. Canmore's Ivan Babikov, (far left) and Edward McCarthy from Vancouver, (middle), chase Gavin Hamilton, from Calgary, on a downhill stretch of the 12 km Canmore Challenge mountain running race at the Canmore Nordic Centre on Saturday. More was at stake than just pride during the Canmore Challenge Saturday at the Canmore Nordic Centre. This year the popular mountain running event ran in conjunction with the 2009 Canadian Mountain Running Championships. Out of the top runners in the eight kilometre and 12 kilometre races, Team Canada would be made for the World Mountain Running Championship. “For the senior men and senior women this is a national selection race to go to NACAC Championship, the North American champion, which is in New Hampshire in two weeks,” said race director Brian Torrance. This year there were a total of about 200 runners, but Torrance said they have the volunteer base to get between 300 and 400 runners next year. The eight-kilometre race acted as the selection race for the senior women and the junior men. Winning for the women was former Canmore resident, now residing in Calgary, Amy Golumbia.